The great KeaRider Australia Best Of motorcycle tour is the perfect choice for a road trip in Australia, especially if you want to see as much as possible of this fascinating continent. Your motorbike tour begins in the south Australian city of Melbourne, where you will visit the famous Great Ocean Road and the gold mining town of Ballarat. Through Canberra, this popular Australia motorcycle tour takes you to Australia's most beautiful city Sydney before you ride along the coast back to Melbourne and cross over to Tasmania by ferry. The island is famous for its unique nature, which is also a home to rare animals such as the Tasmanian Devil. 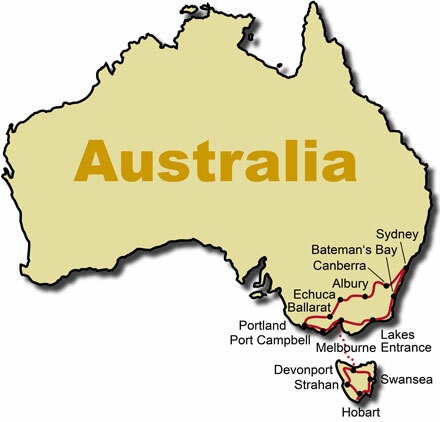 On this motorcycle tour in Australia you will really get to know the fifth continent! After an individual journey, tour participants meet in Melbourne and head towards Torquay, the gateway to the famous Great Ocean Road. You will spend the whole day on the Great Ocean Road, the beautiful coastal road in the south of Australia. Today you will leave the Great Ocean Road and drive inland to Ballarat where you can visit the gold mining town of Sovereign Hill. From Ballarat cruise over the endless highways of the State of Victoria and in the late afternoon you will arrive in Echuca where you will spend the night. In the morning you can take a boat trip on the Murray River with the Paddle steamer Emmylou, before you continue along the Murray Valley highway to the wine-growing areas of Rutherglen. After breakfast in Albury you can further cruise on the Australian highways to the capital Canberra, where you can visit the Government District. Today you will arrive in the largest Australian city which is famous for its harbor. You can explore the harbor in detail during a dinner cruise. Another full day in Sydney is at your leisure. Visit a performance in the famous Opera House or relax by the no less famous Bondi Beach. Back in the saddle of your motorbike leave Sydney and drive over the Princess 1 Highway through the Bendarah State forest along the coast to Bateman's Bay. You will spend another day on the Princess Highway 1 and enjoy the beautiful landscape along the Australian coast before you reach the town Lakes Entrance in the evening. Finally you have reached Melbourne again. With the ferry, you cross over to the port of Devonport in Tasmania. Your first day on Tasmania leads through the rainforests to the Gordon River, where you can take a river cruise, and further on to the Wild Rivers National Park. Accommodation is in Strahan. Past magnificent lakes drive to Hobart, the capital of Tasmania through Glen Clyde House. The rest of the day is free to your disposal. The free day in Hobart can be used for a trip to the Tahune forest. The air walk is particularly exciting. Walk through narrow walkways through the tops of the trees. This morning a visit to the former prison camp of Port Arthur is part of the agenda. This is a reminiscent of Australia's past as a British prison colony. Later you will arrive at the Tasman Devil Park, where you can experience the most famous natives of the island in the wild. On the Bass Highway cruise back today to Devonport and take the ferry over the Bass Strait to Melbourne. After arriving in the early morning you will start your individual journey back home.